We are delighted to announce that, according to the latest Journal Citation Reports®, Polymer Chemistry‘s Impact Factor* has increased to 5.368. This is a great indication of the continued strength of Polymer Chemistry as it approaches its 5th anniversary, and we would like to take this opportunity to thank all our readers, authors, referees and board members for their support and engagement with the journal. Even better news, the journal’s Immediacy Index# has risen to an impressive 1.713, the highest of all primary research journals in the Polymer Science category by some way. Immediacy Index is a measure of how quickly after publication articles in a journal are cited. 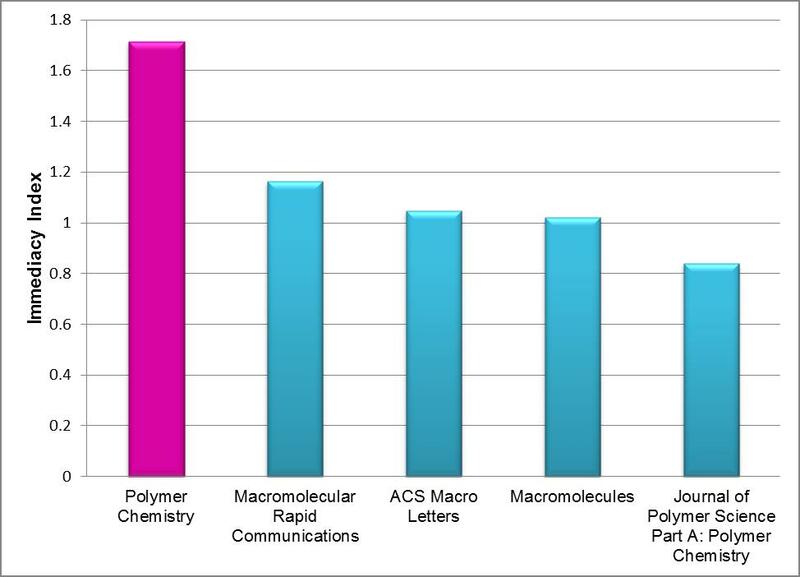 Polymer Chemistry‘s high number indicates that articles are being cited very quickly, and is testament to the high visibilty and relevance of the articles we publish to the polymer community. So, to make sure your next polymer synthesis paper is seen and cited by fellow polymer chemists, we recommend submitting it to Polymer Chemistry! Polymer Chemistry wasn’t the only Royal Society of Chemistry journal to see an increase in its Impact Factor this year. Find a full list of our journals and their 2013 Impact Factors in this blog post. *The Impact Factor provides an indication of the average number of citations per paper. Produced annually, Impact Factors are calculated by dividing the number of citations in a year by the number of citeable articles published in the preceding two years. #Immediacy Index is the average number of citations in a given year to papers published in that year. Data based on 2013 Journal Citation Reports®, (Thomson Reuters, 2014).